Unless you are a Cleveland Cavaliers fan, you were probably too busy watching the World Series and have missed most of the disastrous season that the Cavs are having. Although the Cavaliers were favorite by double digits going into last night’s game against the Indiana Pacers, they self-destructed once again and instead lost by double digits 124-107. So much for the “weak” Eastern Conference that the Cavaliers would face this year. Incredibly, Cleveland is currently ranked 13th in that conference. 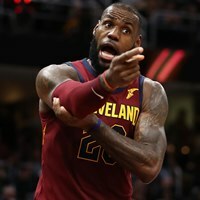 Although some fans and media members would like to think that these early season struggles will be over soon, and the Cavs will be fine coming June, it is worth to point out that LeBron James’ Cavaliers have never struggled this bad and this early in the season. In fact, these last four games are officially the worst stretch of losses in the career of LeBron James. Yes, the Cavs may find a way to be fine in June, but that will require a lot of work from James and his teammates because they have been pathetic at times during these defeats. They have not only lost four straight but five of their last six games. And amazingly, aside from Indiana, they have lost to teams that did not even make the playoffs last year and combined to finish the season 100 games under .500 last season. The calendar already turned to November and the Cavs defense is not improving, instead, some could argue that is, in fact, getting worse. They have been losing by an average of 17 points per game and are now ranked 29th (only better than the Dallas Mavericks) in points allowed per 100 possessions. It’s no secret that the Cavaliers defense has been slow and hesitant in transition. The Cavaliers are the oldest team in the NBA and that is perhaps starting to reflect on the court. They’re not only looking like an aging group when they face running teams, they are also dead least defending the pick and roll according to Second Spectrum data. The Pacers, in fact, scored 57 points last night using pick and roll plays. Cleveland’s offense is also to blame for a good part of the Cavaliers struggles. Against the Knicks, Cleveland shot just 38 percent. In last night’s game, the Pacers shot 61 percent from three-point range, while the Cavaliers shot a dismal 22 percent. Isaiah Thomas will eventually come back to this roster from his hip injury, and although he will help them improve their offense, he will not solve the Cavs problems on defense. The Cavs front office and coaching staff can’t dream about mid-season trades that will magically fix their problems. They must find a way to force their current players to perform a lot better, or otherwise, the front office will have to find a new coach. Tyronn Lue seems to be running out of time and ideas to motivate a talented group that is failing to produce on the floor. Although this team is old, they are not this bad and should be performing at a much higher level. The blame for the subpar performance lies squarely on the players and their lack of effort on the court for the full 48 minutes, but Lue must find a way to motivate them and help point the way out of this slump. If he can’t, he won’t be around much longer.